I've effusively written about restaurants that do modern Asian well in the past, with places like D.C.'s Maketto and Singapore's Candlenut being some of my favorite restaurants I've ever been to. So why haven't I written about St. Louis' Vista Ramen? I don't have an excuse or reason. I just hadn't gone—and that was a mistake. The space is surprisingly small, but the design work on it is top notch, mixing the old brick walls (including an old bank's sign) with modern tiles, light woods, and the Insta-famous neon "Vista" sign. What Chef Chris Bork is doing at Vista is exactly the kind of thing of culinary innovation city needs. If he were to pick up and leave, then reopen the restaurant exactly as is in D.C. or Chicago, I'm confident it would 'play', so to speak. He's pushing boundaries while respecting the background of his ingredients. Pork rinds are tossed in Japanese togarashi, creating the perfect salty/spicy bar snack and enticing you to try one of their fantastic (and, of course, Asian inspired) cocktails. I'd go so far as to say Vista is better known for their KFC (that's Korean fried chicken) sandwiches than their ramen. The extra-crispy chicken is drizzled with gochujang, topped with fish sauce pickles, and laid on a housemade Hawaiian roll. 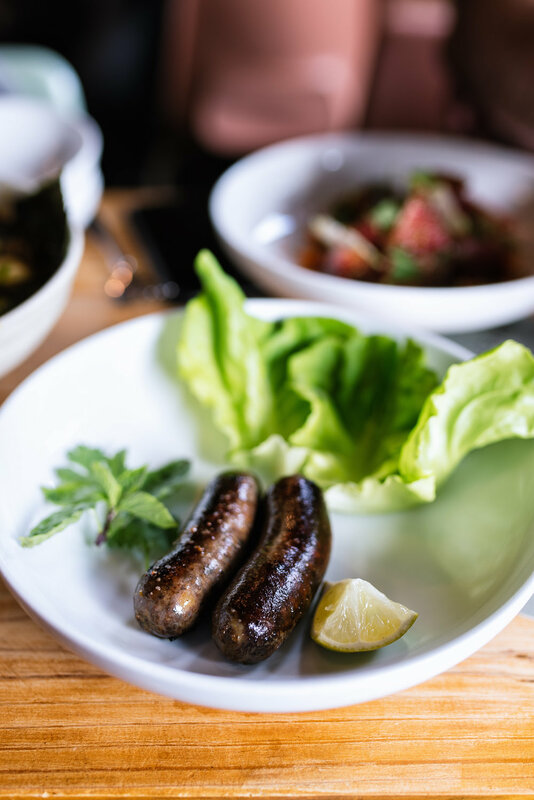 The pictures below are from a menu at the end of summer, though some of the dishes remain, like the beef cheek ravioli with cipollini onion, Sun Gold tomato, and gochujang, and the more classic Thai sausage (sai oua), served traditionally with lettuce and herbs for wrapping. A variation of my favorite dish from this meal, the fried Brussels sprouts, lives on, as well; the sprouts are placed over a green romesco sauce (it was so good, we were dripping the pork rinds in it), gooseberries, radishes, and then finished with Thai basil. I can say with no hesitation that Vista's small plates are some of the best in the city; some of these plates could have been served at the likes of a Sidney Street or Niche. Desserts are equally impressive, and from what I hear, brunch is not to be missed (says the guy has obviously missed it).